Tracy Wang was scribbling so furiously taking notes that it wouldn't have been a surprise to see smoke coming off her notepad. Her attention was completely seized by what was happening in the classroom at the International School of Beijing (ISB). Next door, Shirley Wang knelt as she chatted with grade 2 students, her own notepad forgotten as she helped them with their work and asked about what they were doing. 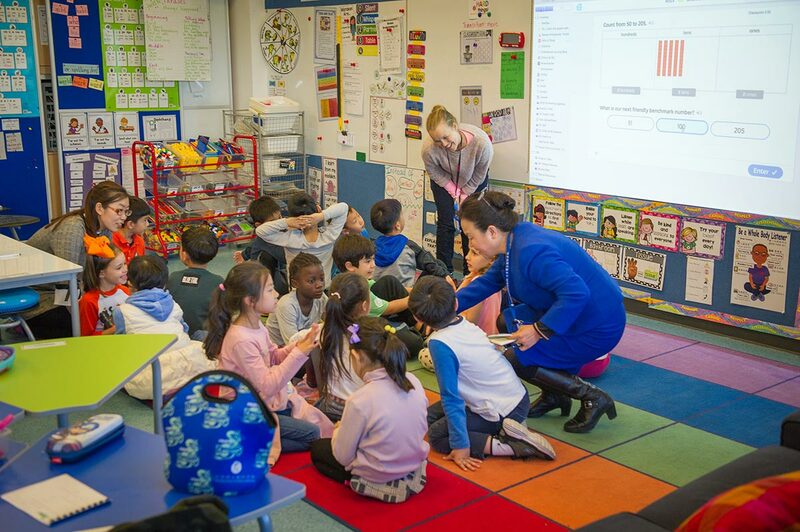 Tracy and Shirley were among four Chinese teachers to visit the ISB Elementary School from October 8 to November 2 as part of a program to support their learning around international educational practices. They may have taken radically different approaches to getting the most out of their internships, but they all finished equally inspired by fresh ideas. ISB helped support the wider learning community by not only immersing Tracy, Shirley and their colleagues in an English-language environment, but also broadening their professional horizons through exposure to alternative pedagogical thinking. ISB was very different to what Tracy and Shirley were used to. The international school's elementary students are empowered to solve problems and question the world around them. This is viewed as a time for young learners to explore ideas and solve problems through inquiry-based activities. Meanwhile, ISB's Whole Child approach gives the same priority to health and character as it does to academic performance. Tracy, who is in charge of elementary school teaching and research at a Beijing teacher training college, said she was surprised to learn that ISB teachers do not teach from textbooks. "In China, from primary school to senior high, we always have textbooks. So I didn't understand how a school could work without them," she said. The answer lay in ISB's inquiry-based and interdisciplinary approach. "The more I understood your teaching methods, the more I saw that your teachers are trying to teach students based on things happening in everyday life, and that teachers are collaborating across different subjects," Tracy said. Shirley, from a grade 1-6 public school in Beijing, said she was struck by the fact that "students were creating and trying new things rather than repeating exercises. Whether they have the right answer doesn't matter – that's a better way of identifying potential." Shirley was also impressed by the Whole Child philosophy ("I see that students need to be smart and have a happy life") and how different nationalities and cultures were respected in an international school ("That encourages different ways of thinking"). 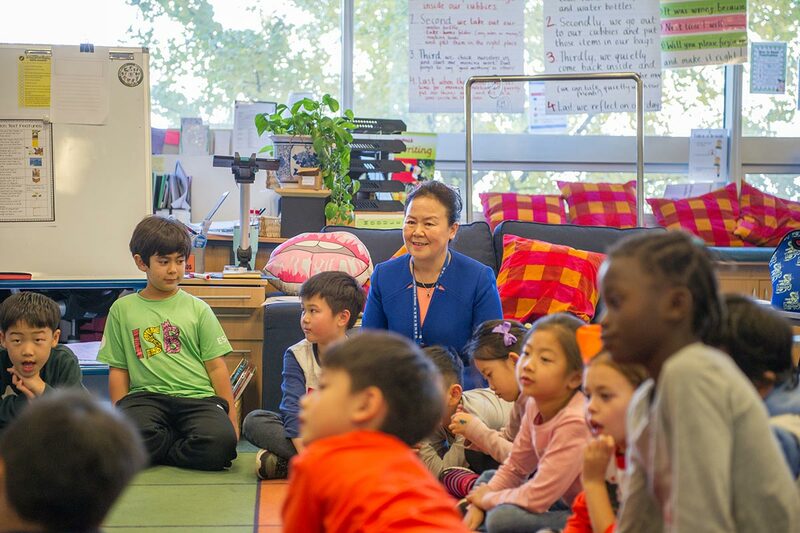 ISB's Erin Fazekas (standing) and visiting Chinese teacher Shirley Wang (far right) interacting with students. ISB's Erin Fazekas, who hosted Shirley, said, "I tried to highlight some of the tools and systems we use, whether it's in math, where we have a lot of manipulatives, or doing a lot of collaborative work and regularly getting the students to share their ideas. I've focused on the fact that we're not always after the answer; we want to know their particular strategies, teaching them to think about their thinking." "I hope all the Chinese teachers go away feeling like they could implement some of the things they've seen," she added. "It's always easier to apply things to your own class if you've seen them in action, rather than just explained on paper." It's likely Ms. Fazekas will get what she wished for. "I will tell my teachers two things," said Tracy. "Firstly, teamwork is very important in a school. Where I'm from, teachers in the same grade discuss students' problems and how they teach. At ISB, it's vertical, so teachers from different grades work together. This is very useful for student development. "Secondly, our teachers should have a different perspective and not just teach textbooks. A lot of Chinese teachers are already thinking about this, but I don't think we're doing very well. We need to consider why we teach the things we're teaching and ask how students can use this knowledge in real life." ISB's teaching is based on a lot of research and expertise. Some of that might spread to other local schools with programs like this.